How Does Water Lily Reproduce? What Time of Year Do You Plant Lily Bulbs? Do Lily Bulbs Need to Be Dug Up? One of the larger varieties in the flower world, lilies come in several cultivars that can make them sometimes difficult to identify. 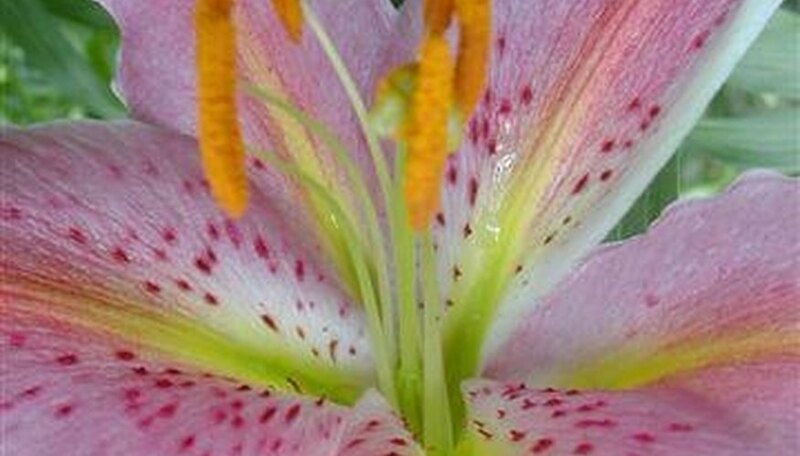 Lily colors include white, yellow, red, orange and multi. In particular, they can be confused with irises because of similar attributes. While the bulb is the most distinguishing characteristic, there are other features that can help you figure out if the flower is a lily. Observe the number of petals on the flower. A lily has three petals and three sepals (the outermost layer of the flower surrounding the petals). Look at the leaves on the plant. Lily leaves have parallel veins along the length of the leaves, while other plants usually have veins that branch out from a single source on the leaves. Look at the inside of the flower to find the stigma. This is found at the center of the flower and holds the stamens (the small sticks that represent the reproductive organs of the flower). The lily's stigma has three distinct sections, which is different from other flowers. Examine the base of the lily plant to distinguish it from the iris. 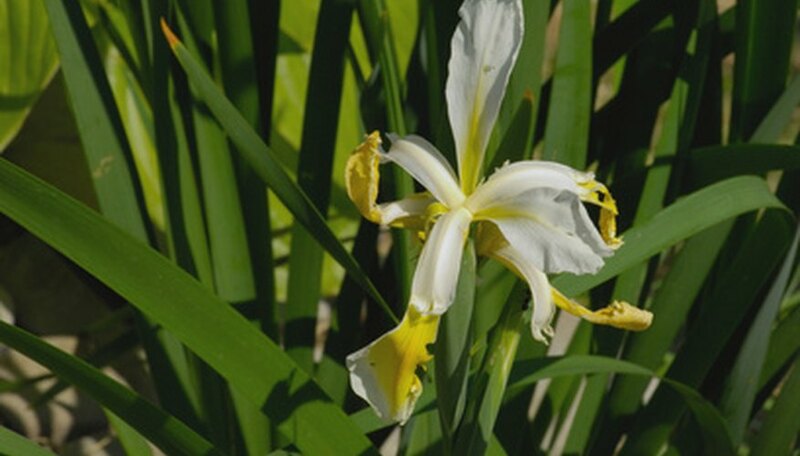 Lilies grow from the base in a more free, loose direction, while irises grow upright from the base. Smell the lily flower. It should have a sweet scent that is strong, not as subtle as an iris. Don't position your lily pads near a fountain or other water feature that could constantly drench the leaves. Lily pads need to stay as dry as possible on their upper surface to allow the entire plant to breathe. Hardy water lilies have pads with smooth-edged leaves, while tropical lily pads have serrated edges. Both type of leaves have waxy upper surfaces. The green lily pad leaves carry out photosynthesis for the water lily plant, providing it with the nutrients it needs to survive and grow. Lily pads provide oxygen to fish and other aquatic life in a pond or water garden. By limiting the light that reaches the bottom of the pond, they help keep algae from growing. Plant enough water lilies to allow the pads and flowers to cover half to three-fourths of the pond's surface. You should pot the water lilies before placing them in the water. Rake as many of the lily pads off of the surface as you can. Use a rowboat or canoe if the lake is fairly large, and have a helper to steady the craft as you use the rake. Avoid boats with engines so you don't stir up the water or tangle the roots too much. 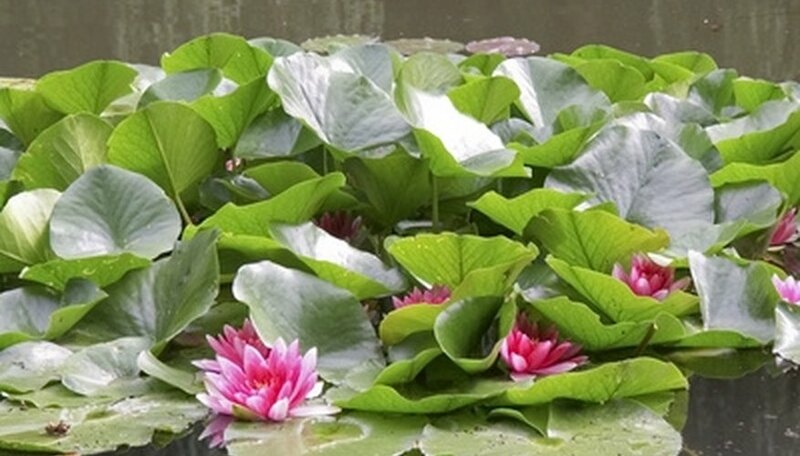 Use a garden sprayer to spray a glyphosate-based aquatic herbicide on the lily pads. Do one small area at a time, because decomposing plants can steal oxygen from the fish in the lake. Read the directions on the label to see how long you can expect to wait for the herbicide to do its work. At that time, use your rake to pull all of the dead lily pads out of the lake that you can, making sure to get as much of the roots as possible. Wait 2 to 3 weeks and then spray another small section; let the herbicide work its way down into the lily pad roots, and then remove the dead ones. This can take awhile in a large lake, but trying to remove them all at once is not a do-it-yourself job, and it's not good for the ecosystem of the lake. Spider lily disease is an infection predominantly developed on the leaves of the spider lily plant, resulting in their premature drying. This infection could be insect-related. Three insects that generally infest the spider lily plants are the Spanish moth caterpillar (Xanthopastis timais), the banded greenhouse thrips (Hercinothrips femoralis) and the snow scale (Pinnaspis strachani). Plants afflicted with spider lily disease were found with leaves that showed curling, chlorotic striping and yellowing. Spots of infection on the spider lily are easily controlled by picking the infected leaves and destroying them. If entire leaves are infected, it is best to discard the whole plant. Insect infestations in spider lilies can be controlled easily with malathion sprays. Over-watering spider lily plants can promote spider lily disease. The spider lily is a fast grower that can reach a height of 5 feet. The flowers are fragrant at night and bloom from summer through fall. Colors range from white, pink and red to striped and multicolored. In the continental United States, the spider lily is hardy in Zones 8 to 10, the three hottest. It is also hardy in Zone 11, which is in Hawaii. Plant in average, well-drained soil. The spider lily needs full sun (at least six hours a day) to partial shade (four to six hours of shade a day). The spider lily needs regular watering. Soak the soil to a depth of at least 5 inches. The soil should never be allowed to go completely dry. Feed once a month with a balanced houseplant fertilizer. The spider lily does well planted near a pond or as a container plant. It is also used in flower arrangements. The Greeks call this plant "drakondea" (dragon flower). It earned the name stink lily because its flower produces a rotting meat smell to attract the carrion-eating flies that perform its pollination. The ruffled, deep maroon flower is not a true flower, but a lipped spathe similar to the calla lily. A long black spadex sticks out of the flower like a spiked tongue. The leaves are fan-shaped and arranged in sets of three. The stem has a snakeskin-like pattern. The voodoo lily bulb is hardy to Zone 5 and prefers well-drained soil. It grows in full sun or part shade, but the blooms last longer in the shade. The voodoo lily produces a seed head that looks like a cluster of red berries. It makes new plants through self-seeding and bulb offsets. Despite the pungent odor and toxins in the leaves, voodoo lilies are processed as food in parts of southeastern Asia. Sprinkle 1/2 inch of soil at the bottom of the container. Place the ghost lily bulbs in the bottom of the container with at least 1/2 inch between each of them. Cover the ghost lily bulbs with high quality potting soil. Fill the soil to within 1/2 inch of the top of the container. Water the ghost lily until the soil is moist. Do not allow the soil to dry out at any time while the ghost lily is growing. Place the ghost lily container in full sun to partial shade, indoors or out, as long as the temperature does not exceed 48 F for at least 10 days. Then place the ghost lily in full sun to partial shade in temperatures not exceeding 75 F.
Pick a spot that is well-drained and where your plant will receive full sun at least half of the day. The stems will lean and stretch toward the sun if the location is too shady. Dig a hole three times as deep as the width of the bulb. For the most striking blooming group effects, dig the hole to the correct depth and plant several bulbs together. Spread the roots out loosely. Cover the transplanted bulb with soil, firming gently as you add more soil. Space the individual plantings so that the leaves of mature plants can dry out easily after a rainfall. This will ensure good air circulation between the plants. Cover the soil with 1 to 2 inches of mulch, such as grass clippings. Water your flower bed thoroughly. Water your oriental lily bulbs whenever the top of the soil begins to dry out. In hot weather, this can mean supplying your lilies with water each day. Do not over-water your lily bulbs. If the ground is damp do not give them water. Choose your planting site. Surprise lily does best in full sun or light shade in well-drained soil and is adaptable to either sandy or clay soil. It is an excellent choice for naturalized areas, among groundcovers or in flower beds. Dig your planting holes or remove the soil from the area where the bulbs are to be planted. Surprise lilies should be planted from 2 to 6 inches below the surface of the soil. The colder your area, the deeper the bulb should be planted. Space the bulbs 6 inches apart and in uneven number clusters. Cover the bulbs with the original soil and water well. A light layer of mulch may also be added. Prepare the planting bed, which should be in full sun; however, triplet lilies can tolerate some shade. Till the top 12 inches of your soil with a garden rake and mix in about 3 inches of organic matter such as sand, compost or peat moss. Plant the bulbs 3 inches below the soil. The pointy tops should be facing up. Space multiple bulbs several inches apart. Generally, leave spaces between the bulbs that are two times the width of the bulbs. Firm the soil so that there are no remaining air pockets. Then, cover the area with 2 to 3 inches of mulch, such as pine needles or bark. Water the area well. Choose a location in your garden that will receive plenty of sunlight and well-drained soil. Mix 2 to 3 inches of organic material such as peat moss or ground bark to improve the soil if the area tends to have puddles. Dig a hole that is approximately 4 inches deep and 2 inches wide for each flower. The holes should be 4 inches apart. Place the triplet lily into the hole and backfill with native soil that you dug from the holes. If you are planting the bulbs, the top part of the bulb, with the point, should be facing upwards. Water the soil generously with 2 to 3 inches of water immediately after planting. The flowers will begin to grow within a few weeks after planting. Allow the foliage to die down and do not remove the dead stems. This will provide nutrition for the new plants in the spring. Spider lilies are a grass like evergreen with leaves that are 8 to 16 inches in length and under 1 inch in width. They flower small white blooms. It can form a 3-foot-tall clump when mature. Spider lily prefers full sun although it will live in shade as well. Keep the soil moist, but in the winter allow the soil to dry out between waterings. The spider lily is hardy from USDA hardiness zones of 8 to 11. It makes an excellent indoor plant in any zone. The “spider” plantlets that will come up on the stalk root easily (they root wherever they touch). You can divide the main root mass as well. There are over 200 different Chlorophytum species. All of them are evergreen perennials. Follow the flower stalk down from the flower to the point where it connects with the leaf stem, because this is the point where you must remove the flower stalk. Use the pruning shears to clip the flower stalk immediately above the leaf intersection without removing the leaf. Discard the flower stalk. Watch the peace lily plant as it blooms so you can remove the spent flowers as they die to preserve the plant’s energy. 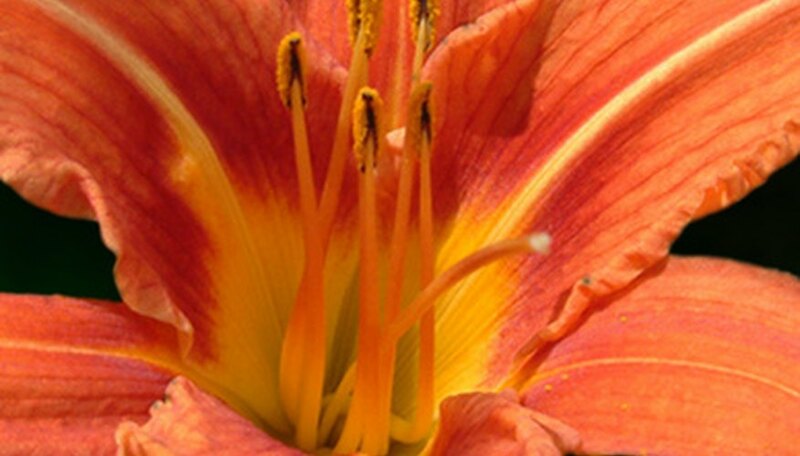 The lily dates back to the Minoan period of history. There were drawings found on the Isle of Crete that date back to 1580 B.C. The lily represented purity and virtue. Early Christian customs used the lily in Easter celebrations. Lilies are one flower that is easily cared for. The main requirement is a dry location to plant the bulbs. Wet soil can cause fungus to develop. This will kill the bulb. Lily bulbs can be planted in the spring or fall. The longer the growing season, the better the bulb will have to establish a strong root system. This is why many people still believe the bulbs should be planted in the fall. Late spring planting is fine for late fall blooms. There are times when bulbs are bought and forgot about. This does not mean the bulb cannot be used. If the weather is permitting, and the ground is workable, plant as soon as the bulbs are discovered. Bulbs, which are discovered well into winter, can also be forced to bloom indoors. This will keep the bulbs fresh and active. Always make certain the lily bulbs that are being planted are still healthy. Brittle or dry bulbs are most likely dead. These plants will probably not grow. Wait until your Skyline Asiatic lily has finished growing. Do not cut or prune your Skyline Asiatic lily anytime during its growing period. Allow the Skyline Asiatic lily to die back completely after the blooms are spent. It will turn brown and then a yellowish color. Cut the Skyline Asiatic back to the ground using a pair of sharp pruning shears. Once the lily has died back completely – usually in the early fall – cut it back to the soil level. The calla lily is most commonly associated with the plant. The name is derived from the Greek word "kalos" meaning beauty. This flower is described in Greek mythology. Hercules, the son of Zeus, was being nursed as a baby by Hera, and when Hercules was removed some of the milk spilled from the heavens onto Earth and the calla lily sprung up. The hyacinth of the genus Hyacinthus originated in the Mediterranean region. It is a fragrant, bulbous flower ranging in colors from lavender, blue, white, red, orange, pink and yellow. The flower's name comes from a Greek myth. A young man named Hyacinthus of Hyakinthos was accidentally killed by the god Apollo. Because he was so loved by the gods, the blood of Hyacinthus was transformed by Apollo and became the beautiful flower when it touched the ground. Choose an area that has full sun or afternoon sun. Fairy lily bulbs can be planted in spring or fall. The location should be high enough that water does not pool. Dig holes twice the height of the bulbs. Space the planting holes 3 to 4 inches apart. Mix one part manure to three parts potting soil to fill in around the bulbs. Place the bulbs with the tips facing up in the planting hole and back fill in with the amended soil. Water thoroughly, soaking the area to help establish the roots. Water again, only when the top of the soil is drying out. Mulch around the lilies as they sprout in the summer. This will help to keep the roots cool and retain moisture. Fertilizer is not necessary for these plants. Lily bulbs need to be dug up every year—and the best time is autumn, after the foliage has turned yellow on the plant.